Question of Kripadham: In connection with the verse about the three gates leading to hell: lust, anger and greed. For me it’s impossible to get rid of these. What is the way to get rid of these? Which qualities one has to develop to get rid of these completely? Tirtha Maharaj: Only one. Give your kama, krodha and lobha to your spiritual master. Make a garland from your bad qualities, offer it to your master and then you will see the miracle. The bad qualities will turn into a beautiful vana-mali, forest flowers garland. Kripadham: This is also very impossible, Gurudev. Because it’s very difficult to offer bad things to someone you appreciate. It’s the same with the spiritual father. Most of the times we come with very serious offerings: “Here is the bucket of my mistakes. And this is the package of my karma, Gurudev! And here is the big sack of my problems also – for you! Just to make you happy; whatever is mine is yours! We belong together!” Therefore gurus must have a big house, with a big storage capacity for all these nonsense. But, you know, to be more serious… Kama, krodha, lobha – all of these might be changed into divine qualities. Kama means desire, right? And not simple desire, but passionate desire. If we add divine love to our passion, it becomes divine passion. 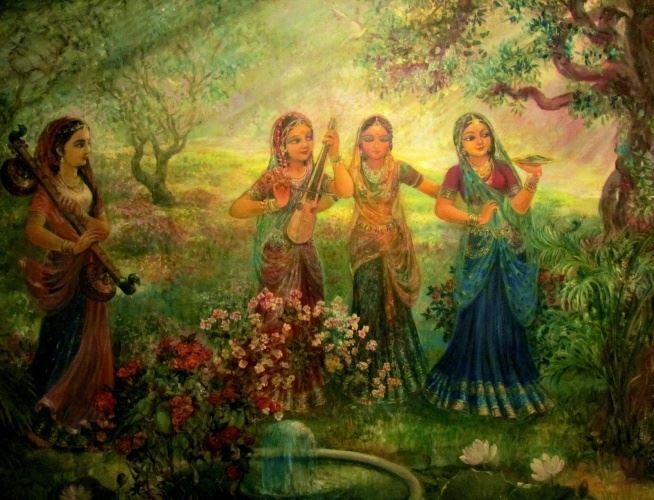 And our ideals, emblematic figures of our faith are passionate lovers of Krishna. So passionate divine love is good; passionate material love is bad. This is about passion; what about krodha, anger? I cannot be angry at my brothers and sisters. So anger is excluded from the temple. Or maybe I can be angry at some other human beings? No, trinad api sunichena, you have to be more humble and tolerant than a blade of grass, than a tree… I cannot be angry at other living beings. Then where can I use my anger? For example, I can be angry at my bad qualities. This is like a spiritual jiu-jitsu. How? The energy attacking you is converted into a positive energy. And lobha, greed? You know, material greed is very stupid. It is said that collecting knowledge and collecting mercy but not sharing with others is the same stupidity as collecting precious metals. But we have to be greedy for the nectar. It is said without greed you cannot achieve prema. Without spiritual lobha, spiritual greed, that we want it – it will not happen. If we have this very special transformation process, then the gates leading to hell will lead us to heaven. It is very much possible. Only one quality we cannot use in spiritual practices and this is envy. Envy we cannot use. We cannot convert envy into spiritual envy. This is the only thing that we should exclude. Other things can be reshaped or converted into spiritual practices. But for that we need an extra energy and this extra divine superior energy is coming from our masters, from the higher authorities. So ultimately we have to dedicate, we have to give these qualities to our masters and they start to reshape them. Question: Is there some example that you can give to illustrate why envy cannot be converted like the other qualities? Tirtha Maharaj: What is the process of transformation? The process of transformation is that you change the object of the activity. If you are passionate about women, you shift the object and you become passionate about God. If you are angry on others, you shift the object and you will use your anger against your obstacles which prevent you. If you are greedy for gain, you shift the topic, you become greedy for God. Instead of the general object you have to put a divine object. So if you are generally envious, you shift the object, you become envious of God. It doesn’t help. It doesn’t help. It’s a good question because envy is still there in most of the cases. We practice, sometimes we practice for dozens of years, but still we are envious. If our spiritual master pays more attention on the next guy and not on me – then we are envious. He prefers the chapati of the other guy, not my chapatis! So we are very weak. General practitioners are very weak. And you might think: “Ah, but this is spiritual jealousy, spiritual envy.” No. Because this is the opposite of manjari-bhaav. Gopi-bhaav means that irrespective of my success I help others to become happy. And manjari-bhaav means that even if I am slightly touched by divine ecstasy and others are fully enjoying divine ecstasy, I am even happier than them. No envy. Therefore envy is excluded from Vrindavana. Passionate approach is not excluded. Greed is not excluded. It can be spiritualized. But certain bad habits and bad conditions should be rejected.